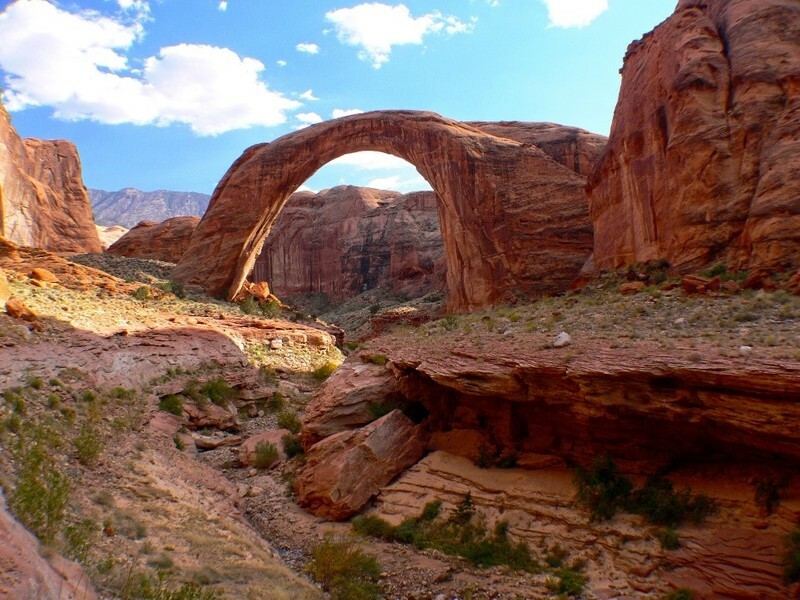 Rainbow Bridge stands as one of the largest natural bridges in the world. It is sacred to six Native American tribes who successfully contested that behavior at the bridge should be respectful because of it’s great cultural importance. 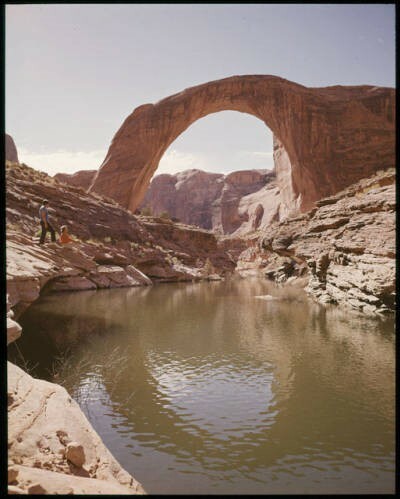 Rainbow Bridge sits at the southern edge of Lake Powell at the tip of Forbidding Canyon, which extends out from Glen Canyon. It stands at 290 feet tall and 275 wide, making it one of the largest natural bridges in the world. In 1909 Byron Cummings and W.B. Douglass publicized the bridge to the world after they saw it with the help of Paiute guides. For centuries Native Americans have known about the bridge and have incorporated it into their spiritual understanding. President William H. Taft designated the bridge a national monument in 1910, and visitors included Teddy Roosevelt who considered the bridge as one of the wonders of the world. The waters of Lake Powell rose up to and under the bridge due to flooding from the Glen Canyon Dam, despite the fact that the Colorado River Storage Project Act of 1956 included provisions to protect the monument. Environmentalists took this to heart and there was a new zeal to stop such a thing happening again. The lake changed the accessibility of the bridge as the water allowed tourists to travel by boat to the arc, taking away from the challenging and adventurous journey experienced before. For Native American tribes, this new accessibility presented new problems. Rainbow Bridge is an important religious site for the Navajo, Hopi, Ute Mountain Ute, San Juan Southern Paiute, Zuni, and Kaibab Paiute. These tribes felt that Lake Powell was tarnishing their sacred sites and Rainbow Bridge was their biggest concern. 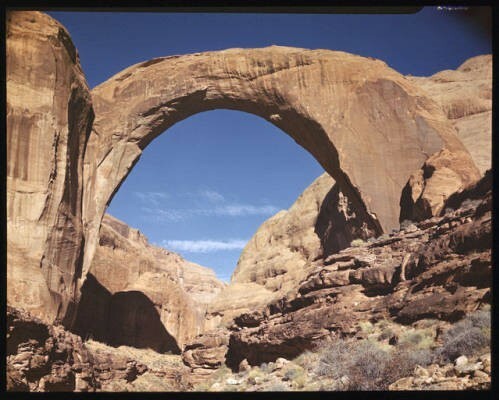 Lake Powell attracted tourists who considered the bridge a part of their vacation experience without respecting its religious significance. By the mid-1970s visitors to the bridge were demanding that drinking fountains be installed alongside trash cans for the waste. The bridge had become a part of the party and vacation atmosphere that surrounded Lake Powell. In 1974 members of the Navajo tribe filed suit against the Bureau of Reclamation, as well as the Director of the National Park Service and the Secretary of the Interior, in an attempt to preserve their religious site. 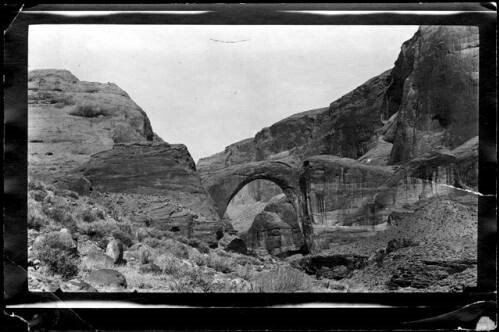 They lost when the district court of Utah ruled that the Navajo did not have a claim to the land the bridge was on. They also lost their 1980 appeal, as the Tenth Circuit Court of Appeals argued that in this case water storage was more important than religious rights. In April 2017, the National Park Service recognized Rainbow Bridge’s significance to Native Americans by designating it a Traditional Cultural Property. The national monument is the first site in Utah to receive such designation. The hope is that such designation can better preserve Rainbow Bridge for years to come; now any federal project that could impact it has to undergo a vigorous review. For example, geologists have been measuring the vibrations felt by the bridge. Certain actions such as drilling and construction cause vibrations that put strain on the bridge. Most importantly, the designation is a vital step in recognizing the bridge’s cultural and religious significance to many Native Americans. 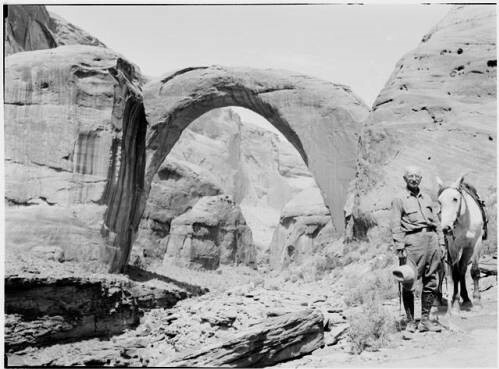 George Mumford, Northern Arizona University, “Rainbow Bridge, Native Peoples, and Tourism,” Intermountain Histories, accessed April 19, 2019, https://www.intermountainhistories.org/items/show/63.